One of my favorite movies from the late 90s, during my teenage years, is The Edge, a razor-sharp yet simple thriller about two men, a bear, and survival. In that way, Walking Out isn’t a far cry, as far as the plot is concerned anyway, though this film focuses on family and coming together, while the former takes a much darker turn. They are also completely different in quality, especially quality of performance, and that’s where this movie begins to resemble something else entirely. For while the story and the setting hold up, the acting does not, and that’s when audiences will have the most trouble continuing the trek. David isn’t a country boy, but he finds himself in Montana anyway, despite his wishes. His parents aren’t together, his mother and he live in Texas, but his father is a certified mountain man, living in the middle of northern nowhere, with only snow to keep him company. David makes his yearly visit, but all he really wants is to play on his phone and pass the time, not try to become the hunter his father so desperately wants him to be. He does a little bird shooting, listens to stories about his grandpa, and counts the hours until he can return home to a life that is much more his style. Cal, the father, isn’t an awful man, he simply wants his estranged son to follow in his footsteps, the way he followed in his own father’s, picking up the love of hunting for your supper in the great, expansive wilderness. David does eventually concede to go on a long hike into the mountains to find a moose that Cal tracked earlier, to make his first kill as a young man. But it’s no joke up there, you could die in any number of ways, father and son about to learn this the hard way. When Cal is injured, David must carry him home, summoning all his strength and perseverance for the impossible task ahead. First, the good, then we’ll talk about the bad. The film looks great, that’s probably the best that can be said about it; it’s nice to physically watch. 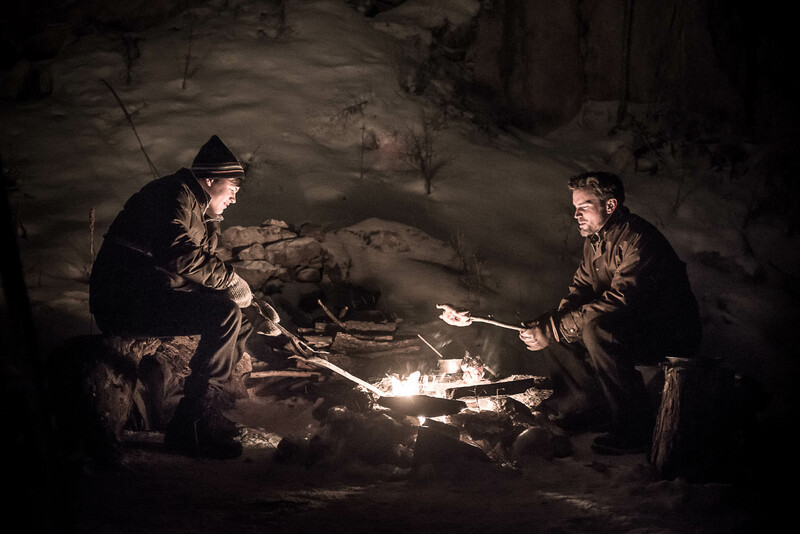 The mountains, the snow, the streams, the trees, the campfires; from the first shot on, audiences are given solid visuals, capturing the spirit of the unforgiving landscape very well and allowing us to be transported to a place that’s much easier to visit from our living rooms. The film isn’t long, the plot is simple, the characters are few, we receive some backstory; the stage is set well, everything is available to us and to the filmmaker, the problem lies solely in the execution. Acting is what I focus on when watching a movie more than anything. No story, no passion, no music; I’ll forgive most anything if the actors involved convince me that they are invested completely, that their skill can and will pull me along. Obviously there are exceptions, but Walking Out isn’t one of them; the acting failed and therefor so did the intent. Bomer was never going to get us on board, Pullman is more a joke than a serious casting, and although I held out hope for Wiggins coming in, there was a scene near the beginning when he decides to go on the hike that offers no explanation, no reason for changing his mind, and he is unable to convey his character’s emotions in a way that satisfies questions. These three men couldn’t perform their duties well enough to make magic, and that’s a disappointment. Video – With an aspect ratio of 2.40:1 (1080p HD Widescreen) and with cameras and lenses by Panavision Sony F55, the crisp air video quality of the Blu-ray disc might be the absolute highlight of the film. Most scenes are outside, in the snow, cold and clear, with mountains in the background; no complaints here. That sort of landscape lends itself to some solid visuals, and the movie didn’t miss out on capitalizing on them. Audio – The Blu-ray was done in 5.1 DTS HD Master Audio, with an option of 2.0 DTS HD Master Audio, if you so desire. Subtitles are available in English and in Spanish. 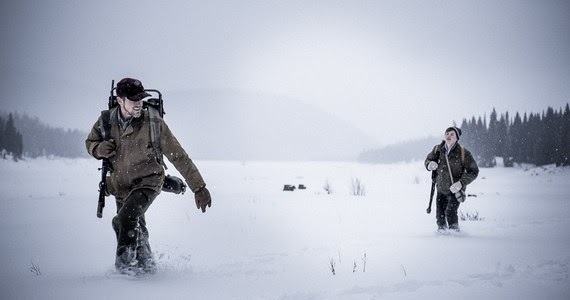 That’s it for the sound, and there isn’t much of a soundtrack, with father and son trekking through the frozen tundra most of the time, conversing while trying to catch their breath and remembering through flashback. Extras – The special features on the disc are few: Deleted Scenes (7 total), Behind the Scenes – Made in Montana (3 minutes long), and a theatrical trailer. Rent It. Very quickly, I realized that Walking Out wasn’t going to be as bad as a movie you never heard of could be, but that it also wasn’t going to surprise. It had a very specific ceiling, and that cap probably has more to do with the acting talent available to the director than with anything else. A different casting would have resulted in a far different film; I know you can say that about every single project, but that fact is very clearly on display here. The video held up its end, the audio was forgettable, and there aren’t many bonus features on the disc, so the technical aspects are a bit of a mixed bag. Perhaps if acting isn’t something you focus on, if what you want is a simple father/son story, then you might find some enjoyment from this film, that’s not a preposterous idea, but keep your expectations low either way.